The basic method to reroll for both iOS and Android is to reinstall the app. 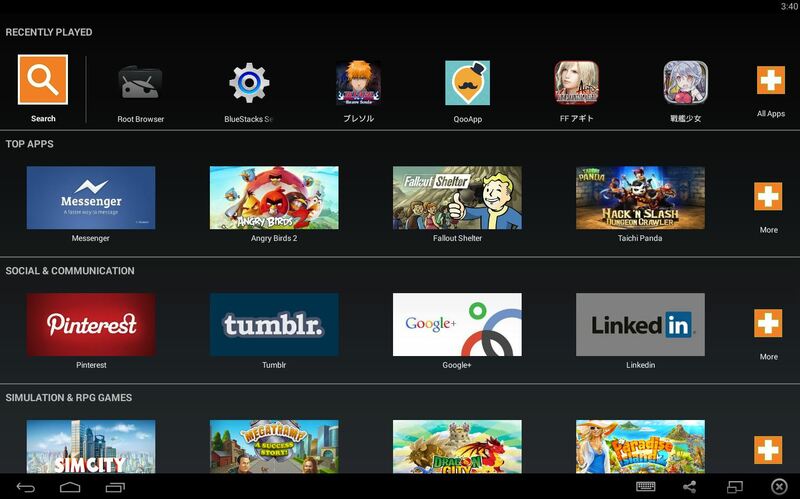 However, there is a faster method you can reroll by using BlueStacks (Android). The following guide is taken and edited from Reddit so credits to the original author ZettaiUnmeiMokushirk. You can find his original post here. First you need to install Bluestacks on your computer. It is an Android emulator and will be your platform for rerolling. After you installed Bluestacks, you need to install the Root Browser mobile app on it. It allows you to access your game data later. If you installed everything, it should look like this. Just like how you would start the game on your phone. Enter a name, play the tutorial. The default controls are running with left mouse click and attacking with the keys z, x and c. You can change the key mapping by clicking on the small keyboard at the bottom. After a few re-rolls, you’ll get used to it. A small initial download starts and after you completed the tutorial the game download starts. Depending on your connection it will take a while. Note on the free pull during the tutorial: there are only 4 characters that you can pull from. The best and the only 4* character you can get is Jūshirō Ukitake, followed by the 3* Rukia, Byakuya and Chad in order of usefulness. Once you get back to the game, you can either grab the 45 Soul Orbs in your mailbox to do one pull or, play stage 3 and you’ll get another 5 Soul Orbs to do 2 pulls. Time to test your luck! Remember, the game currently does not have an evolve system so a 5* start is definitely important! First exit the game. Don’t just click the homebutton, you need to properly exit the game. A quicker way of exiting is terminating the task in the settings, but don’t clear data. You need to scroll down a lot to find the Bleach folder, but in the end it should look like this. Follow this closely! Inside the shared_prefs folder is a file named com.klab.bleach.xml. 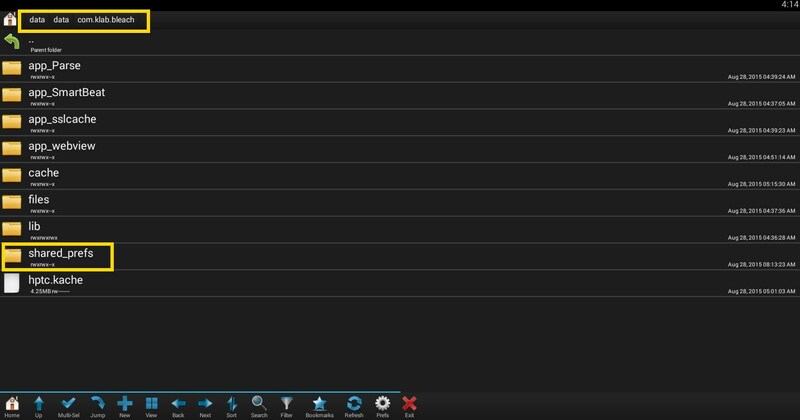 This is where your account information such as your UserID is stored. You want to rename that file. Press down the left mouse button until a prompt to rename it shows up. You can rename it whatever you want, but something like com.klab.bleach01.xml or com.klab.bleachAizen.xml marking your best pull is advised. This way you can always go back to that account by just renaming it to the original filename com.klab.bleach.xml again. You can switch around between accounts without having to link it to Facebook. 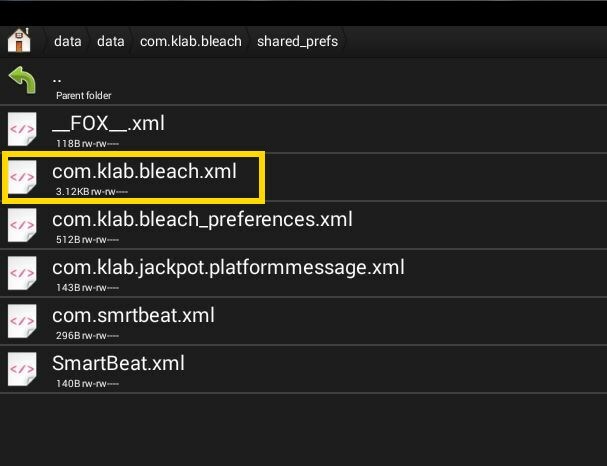 But make sure there is only one original com.klab.bleach.xml in theshared_prefs folder. You can keep the renamed ones in that folder too, but don’t clear data in the task manager. If you do not wish to keep your accounts, you can just delete the file. However, your account is gone forever if you do this! Now you’re ready to reroll. Press the home button and open the Bleach app again. It will not start properly due to the missing file. If this happens, press the home button once more and open the app right again without terminating the task. Usually the opening will start playing. The game is asking you to start over. After that, just complete the tutorial again until you get the 50 jewels for two pulls. If you don’t like what you got, just keep repeating steps 4 and 5 again. Note: There is no “big download” this time, since you kept the data. However, the initial small downlaod still seems to be there. Write down the pulls you get. If you get tired of rerolling, you can always go back to an old account by renaming the preferred file tocom.klab.bleach.xml again. Of course you can also go beyond the first 50 jewels to scout for more pulls. for those on jailbroken iOS, the most practical is to use the tweak “Slice” wich switch the whole conteiner data folder of bleach for each different slice. meaning you need to copy the “library>aplication support” in each new slice to avoid the ~800mb data download. still there is 100mb to download. One question though, once I finish this how do I get this data onto my android phone??? Guys, can u help me i installed bluestacks but i dont have the bottom ledge – the home button etc. Please help me. Stands back from the keyboard in amnaemezt! Thanks! I used to use Huggies untill I found out that Targets brand diapers called Up and Up work just as well. And diapers are always on sale somewhere, so there is no need to diaper crazy just yet. Buy a few packs, then wait till the baby is born and you need them. Simon – No, the processing isn’t too gimmicky IMO, it’s just a new toy to play with…people who say otherwise are usually just set in their ways. The non-photographer general public likes it a lot in my experience. How you doing it – PS or Picnik? "Exposed as lies at HisTALK?" Wow! That proves it, then! Koppel and Kreda were just making it all up! Apparently they were. If you're going to make claims about gag clauses, you should probably have some evidence to back it up. You clearly don't. Appreciating the dedication you put into your blog and detailed information you offer. It’s good to come across a blog every once in a while that isn’t the same out of date rehashed material. Great read! I’ve bookmarked your site and I’m adding your RSS feeds to my Google account. No sabes como me ha gustado esta entrada… Creo que hay pocas cosas que me gusten mÃ¡s que iluminar la noche con la luz de las velas!! !Esta noche es muy especial para mÃ­. AsÃ­ que hoy me siento renovada…Un besote gigante y gracias!!! My new save replaced I spend 4 days hard playing and I got ichigo hollow 5 star!!!! So the new replaced from the old from Facebook how I can find it again !!!!!!!!!! HELPPPPPPP!!!!!!! This is serious help !!!!! Do you know if we can rewrite the save and choose the number of orb ? Hi, does anyone know how to reroll using titanium backup? Hi, I tried your method with my samsung galaxy s5, but it does’t work. Last time I also deleted the file named com.klab.bleach.xml into the shared_prefs folder, but the game still load everything as I did nothing. It doesnt reroll. Whoever edits and puhislbes these articles really knows what they’re doing. Hi MichaelYour definition is fine with me. It does however radically exclude Albert Einstein, Vladimir Horowitz, Franz Kafka and any other Jew I’ve ever held in esteem. It’s really saying: only absurd Jews get to call themselves Jews. Sneakers that you may put on to the workplace or otherwise gown up have been tried. They’ve failed. Sandals, however, might be dressed up properly, particularly with the splendid designs for the 2008 season. Sneakers aren’t going to impress at that quarterly results presentation – a cultured pair of sandals will.On a hot summer season day the last thing you need to do is fiddle together with your shoes to get out of them. When you are cute fitflop sale sandals on sale strolling next to that physique of water and you are feeling the urge to dip your toes in, do you really want to spend five minutes fiddling with laces? Thirty seconds twiddling with straps, on the most, is probably the most time that you just want to spend. Want to obtain muscles fast and become huge? No need to wait months and months, get the best Muscle Boosting BodyBuilding Supplements! Whats Happening i’m new to this, I stumbled upon this I’ve found It absolutely helpful and it has helped me out loads. I am hoping to give a contribution & assist other customers like its aided me. Great job. Looking for the most easy service for translation online? GLS collects over one thousand translators from different countries of the world. Be sure that you will get your translation for sure. We translate to 40 languages. You do not need to look for a translator in translation services berlin. GLS is a service that solves any problems of the documents translating. You can provide information for translation in any convenient format by email or using one of the file sharing tools. For instance, you live in London and need to translate your text fast. You do not have to look for translation company London. You just open translate-document.com and give us the file. Tomorrow the translator prepares the translation. We check his work respectively to the international quality control standards and send it to you. Regardless of where you are, the price will be the best. For example, in translation companies berlin offline in the office it will cost twice as expensive. If you are blogging on the Internet and want to publish unique content using translations, the translate-document.com service optimally solves your task. You can publish materials in the desired language using the source posts from Web-pages in any language. It guarantee that you will fill your blog with unique texts and will not spend a lot of money. You can bet that the Wii Sports Resort will also be very difficult to find when it first comes out. A chosen leader gave directions like “traffic off to the right,” where call the little circles turned to the right and kept turning until the leader said, “traffic left,” after they quickly shifted and started turning left. The Walnut Hill School, in Natick, MA, can be a performing arts boarding school and day program. Modern drugs and inhaler means the people an average and healthy life. Most of my clients notice a massive difference in their breathing within the first 10 minutes, typically a 20-30% reduction in overall breathing restriction. Examples of ingredients such medicines are: Methylsulfonyl methane, vitamin C, vitamin E, Echinacea purpurea, Quercetin, grape Seed, Stinging nettle, Coleus Forskolin. Astelin not contain pseudoephedrine, but possesses his own natural decongestant effects built-in. We are the American Academy of Allergy, Asthma & Immunology (AAAAI), and now we are here to assist you feel great and live better. Ragweed term used to refer to a variety of plants from the genus Ambrosia. body to termination its nawtural output of hormones. Crestor is one such statin that can help in preventing the risk of heart diseases and thereby, lowering the cholesterol inside body. Cholesterol is a a wax-like and fat-like mass which seen in every cell of human body. It is possible to be creative regarding how to incorporate legumes inside your diet.